I’ve always found the transient nature of Portsmouth society pretty interesting. As a port people have been coming and going from the place for hundreds of years. In fact, Portsmouth probably knew more about Immigants and Emigrants than any other place before the Empire Windrush. My research into Portsmouth’s World War One dead is throwing up some pretty interesting findings with regard to people either leaving Portsmouth or coming here. A number of Portsmouth men were killed serving with foreign military units. 5 men were killed with African units. 12 were with the Australian Army, as well 6 men who were loaned to the Royal Australian Navy. 29 men were serving with Canadian units, 3 with Indian units, and 2 New Zealand. For many of these – in particular Australian and Canadian – their service records survive, so it should be possible to research their careers and lives in a fair bit of detail – how did they come to leave Portsmouth?I suspect that some may never have set foot in their ‘adopted’ country, but might have been transferred in theatre as manpower needs dictated. All the same, the majority of them probably emigrated in search of a better life, and im many cases, were killed serving closer to their homeland than they could have ever imagined. Gunner Alfred Baulf (RFA), Gunner Henry Berger (RFA), Private Henry Bosonnet (15th Hampshires), Private Cyril Brunnen (2nd Hampshires), Lieutenant George Cosser (6th Hampshires), Private Walter De Caen (2nd Hampshires), Lance Corporal Joseph Hassalt (South Wales Borderers), Private John Hedicker (2nd Hampshires), Lance Corporal Harold Heffren (1st Hampshires), Private H.W. Heinman (2nd Hampshires), Lance Corporal R.J. Pamphilon (London Regiment), Sergreant Albert Petracca (Army Service Corps), M. Weiner (not yet identified, Ships Cook William Boggia (HMS Victory),PO Frederick De Barr (HMS Natal), PO Walter De Ste Croix (HMS Hampshire), AB Charles Farlou (HMS Ardent), Telegraphist John Hefferman (HMS Princess Irene), Chief Engine Room Artificer William Lucia (HMS Queen Mary), Sick Berth Attendant Arthur Mazonowicz (HMS Victory), Gunner Albert Mehennet (RMA Siege Guns), Signal Bosun Arthur Mortieau (HMS Hampshire), Officers Cook 1st Class Herbert Weitzel (HM Yacht Zarefah), Musician John Whichello (RM Band Service), Alexander Zeithing (unidentified), Gunner Albert Rosser (RMA, HMS Vanguard), Officers Cook Alfred Santillo (HMS Goliath), PO William Koerner (HMS Niobe). There are also quite a few men who came from ‘foreign’ places with links to the British Empiure – 17 men from the Channel Islands, and five from Malta. Many of these men may have fled strife at home – possibly some French-descended men of Hugenot origin? – or perhaps Eastern Europeans of Jews fleeing pogroms in Central and Eastern Europe. Sadly for many of them service records are not available, but it might be an interesting exercise to try and chart their lives. PO George Temple (Bermuda), PO Samuel Greenway (Ceylon), AB William Morrison (Ceylon), Lieutenant George Walker-Williamson (India), Cooks Mate William Opie (India), Cooks Mate Frederick Shephard (India), Warrant Mechanician Thomas King (New Zealand), Leading Seaman Edward Williams (Campos Gabrielle, South America, possibly Chile), Chief Engine Room Artificer Stamper Wade (Boston US). They all have distinctly British names, so it would seem that they were born to British parents who for whatever reason were living or working abroad. Interesting that many of their places of birth – India, Ceylon and New Zealand for example – were part of the British Empire. I’m not sure if it’s just me, but Stamper Wade sounds like a typical American name! It would also be interesting to find out about Edward Williams – as far as I can tell, Campos Gabrielle could be in Chile. We don’t know quite as much about the provenance of men who served in the Army, but on his Commonwealth War Graves Commission entry we see that Private Henry Hodge was born in Barbados, but was living in Cosham at the time that he was killed. Again, it would be very interesting to find out why! It’s a great way to not only find out about people, places, topics and facts about Portsmouth, but it is also very much YOUR website – you can contribute your own stories and your own pictures. This is something I’m really excited about – there has been a lot written about the history of Portsmouth, but this is a great opportunity for the people of Portsmouth themselves to write THEIR history, from their perspective. There’s also a forum to get involved with too. For the most part, I have confined my WW1 research to people who either lived, were born or had strong connections with the area bounded by Portsmouth city. But my brother has tipped me off on an interesting little subject from a small village just to the north of Pompey. My brother is a middle distance runner, and on one of his recent training runs he passed through the small village of Soberton, near Droxford and Bishops Waltham. It’s on the back road from Portsmouth to Winchester. Anyway, near the centre of the village is a Great War Memorial, as in many villages, consisting of a hewn stone cross and a plaque of names. And it’s that plaque of names that grabbed Scott’s attention, there being four men of the same surname. This is remarkable, and in such a small village too. Staff Sergeant 131 1st South African Mounted Rifles. Died on 30/11/1914 Age unknown. Commemorated at Barnea Siding Burial Ground, Bethlehem, Free State, Africa. Apparently John Twynam was killed accidentally by a lightning strike. Second Lieutenant 11th Bn. Border Regiment. Died on 18/11/1916 Age 25. Son of the late John and Mary Twynam, of Soberton House, Droxford, Bishop’s Waltham, Hants. Waggon Road Cemetery, Beaumount-Hamel, Somme, France, A. 24. Born Droxford Apr/May/Jun 1891. The 11th Borders were a Kitchener Battalion, so it is probable that Godfrey was a wartime volunteer. Lieutenant H.M. Submarine E.36. Royal Naval Reserve. Died on 19/01/1917 Age 29. Son of John and Mary Twynam, of Soberton House, Soberton Hants.. Commemorated at Portsmouth Naval Memeorial, Hampshire, United Kingdom, 27. Born Droxford Apr/May/Jun 1888. Earlier censuses suggest that he had served as a cadet in a training ship on the Thames, and was then a Mate in the Merchant Service. Like many Merchant Seamen, he seems to have also been a member of the Naval Reserve. Corporal 16391 7th Bn. Canadian Infantry (British Columbia Regiment). Died on 24/04/1915 Age 33. Son of the late John and Mary Rachel Twynam, late of Soberton House, Soberton, Hampshire. Commemorated at Ypres (Menin Gate) Memorial, Ieper, West-Vlaanderen, Belgium, Panel 18 – 28 – 30. Born Droxford Jan/Feb/Mar 1883. William was in Canada at the time that war was declared working as a clerk, and seems to have volunteered straight away for Canadian forces. An earlier census states that he was a bank clerk. His attestation papers state that he had served with South African forces for five years. After a little more research, it transpires that the Twynams were an ancient family with a long connection to the Soberton area, as might be expected of a family living in what appears to be the Manor House. In the 1891 census the family had four domestic servants, including a governess, a nurse and a cook. In an earlier census it is suggested that the family were involved in farming, employing a considerable number of people locally. Hampshire Records Office holds title deeds relating to land and property owned by the family, and also wills of several of the family members. I mentioned yesterday a fascinating memoir about the life of a missionary priest in a late nineteenth century Portsmouth slum. I’ve actually found a copy of it available to read online. Click here to take a look. Father Robert Dolling was a pretty interesting character. An Anglican Priest, he had a strong liking for what were virtually Catholic rituals – for instance, giving masses for the dead – yet at the same time, showed much of the evangelical zeal seen in many a non-conformist. But in his case, he was not converting savages in the rainforests, but bringing salvation to the desparate poor of Britain’s biggest naval town. The mission was funded by Winchester College, one of the most prestigious public schools in Britain. Dolling came to Portsmouth in 1885, apppointed to run an Anglican mission church in the area of Landport. Just outside the Dockyard walls, Landport was inhabited by many sailors, dockyard workers and their families, and was probably one of the most deprived places in the city. Dolling went out into the community, and his observations are social history goldust. He frequently allowed locals to sleep in his house, on one occasion sleeping in the bath to allow others to sleep over. He set up a gymnasium, classes, and worked in the community with the sailors and their families. His book contains invaluable observations on their morality, work, clothing, health, leisure pursuits, and the transient nature of Portsmouth society. And we need to remember, this is the society into which the vast majority of Great War Dead were born. By the time he left in 1895, Dolling left a galvanised Parish, who worshipped in an incredibly opulent church – St Agathas. Two sets of my grandparents were actually married at St Agathas, by Dollings successor – Father Tremenheere. I’ve visited it myself, and I genuinely thought that it was a Catholic Church. It has a fantastic Sgraffitio by Heywood Sumner, and is built in a Mediterranean Basillica style. Whilst it was built in the middle of slums, almost like a guiding light to the feckless poor, during the Second World War the surrounding slums were largely decimated, and the remains cleared in peace time. For many years the building was actually used as a naval storehouse, until it was restored as a church in the early 1990’s. Now, it stands, lonely, near the Cascades shopping centre. Apparently, despite enthusiastic fundraising, Dolling spent more than £50,000 during his time at St Agathas, and when he left the parish it was over £3,000 in debt. Dolling was personally responsible, and apparently wrote his book to go some way towards clearing this debt. Dolling himself was eventually forced to resign in 1895, when the new Bishop of Winchester refused to allow him to dedicate a special altar for the giving of masses for the dead – unsurprisingly, given the level of anti-catholic feeling at the time. In the Appendix of his book Dolling actually publishes a lenghty, and eventually heated correspondence with the Bishop. It is intriguing to say the least why Dolling did not just go the whole hog and convert – as in the case of Cardinal John Henry Newman, the most prominent Anglo-Catholic. But Dolling does seem to have taken to his role as Parish priest with great relish. But at the same time, he does, like earlier victorian social investigators, talk about his poor parishioners as if they are animals, waiting for salvation. He undoubtedly cared about them, but in a way that we nowadays would find far too paternalistic. A curious and contradictory man indeed. My first book has only been on the shelves for a matter of days, but I guess its never too early to start thinking about lessons learnt, and how I might be able to do things differently next time around. So far, everyone who has read the book has seemed to really enjoy reading the individual stories that I was able to tell. For some of the casualties I researched, especially officers and medal winners, there certainly was a lot of information out there. But the interesting thing is, for, say, a Private who was died of illness and didn’t win a medal, its next to impossible to find out much about him. As a result, I virtually had to write about what I could, based on the sources that were available. One of the big differences between researching World War Two dead and World War One dead is the vastly different amount of information available. For Second World War Dead, the CWGC only tells us what area somebody came from. And not in all cases either. By contrast, for the Great War, for many we not only have the area that they came from, but also their street name and even house number. This enables us to build a unique picture of Portsmouth, that would impossible for the Second World War. But the information does not end there. For sailors and Royal Marines, we can obtain their service records. Even though to download a few thousand of them would cost me megabucks, the National Archive’s search entries give us a date and place of birth for sailors. For Royal Marines, we can see their date of birth, but also their date of enlistment. Hence for sailors we can chart immigration into Portsmouth from elsewhere, which could lead to some groundbreaking research. Also, we have a wealth of information available from the censuses of 1901 and 1911. Already, these have helped me to gain an insight into casualties previous careers, their households, their neighbourhoods, and their families. Something that is impossible for the period 1939-1945. And this gets me thinking : while there is a dearth of information about individuals, such as medal citations, there is a treasure trove of sources available for broader social history. Maybe it would be interesting to look at Portsmouth in 1914, through the historical microscope that the Great War provides us with? Nobody has really looked at the late victorian and Edwardian working class communities of Portsmouth – these, inevitably, are the communities from which the vast majority of war dead came. Lets think about an area such as Landport. Straddling the Dockyard, it was home to thousands of sailors and Dockyard workers. If ever a community was a Navy community, it was somewhere like Landport. Using the CWGC entries and the census, it should be possible to look at a multitude of facets of life – occupations, families, leisure, recreation, housing, and even sanitation and healthcare. How many naval pensioners resided in the area? How many worked in the Dockyard? How many pubs were there? What were the levels of crime like? There is an interesting element to the Landport story. Inspired by the den of iniquity for which the area was infamous, in 1885 an Anglo-Catholic Priest, Father Robert Dolling, set up a mission in Landport, funded by Winchester College. 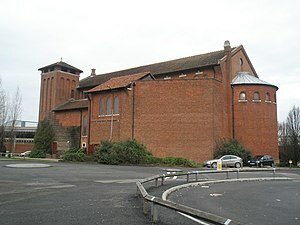 For ten years he ministered in the area, leading to the opening of the church of St Agathas in 1895. Shortly after Dolling resigned, when the Bishop of Winchester refused to sanction Dolling’s preference for what were virtually Catholic worship rites. The year after his resignation Dolling published Ten Years in a Portsmouth Slum, based on his experiences in Landport. I haven’t read it, but I’m hoping that it will be one of those rare, invaluable social investigations, a la Charles Booth in the Victorian period, and Mass Observation in World War Two.